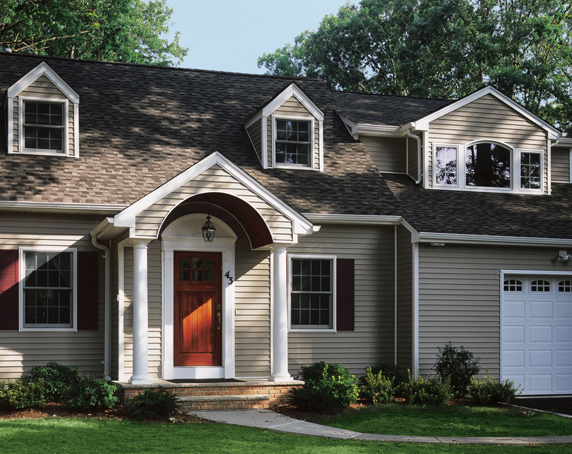 VINYL SIDING,THE #1 SIDING IN U.S. COMPARE COLORS, TEXTURES AND PRICES. Vinyl Siding 'is the number one selling' home siding material in the U.S.
Vinyl out sells all other siding's put together! Can Withstand Hurricane Winds - Very Affordable - Never Needs Painting!! 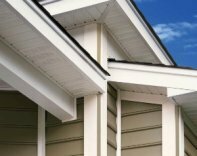 Vinyl siding comes in three basic types. Each different type comes in many different colors, thicknesses and textures, and prices. Clapboard, or Horizontal Siding. Sometimes called Colonial Style or Ship Lap Siding. Looks like long wooden planks nailed horizontally across your house. 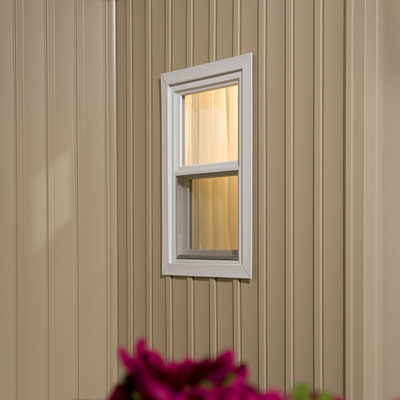 Board and Batten Siding or Vertical Siding runs up and down, or vertically across your house. Sometimes called "Barn Siding" because it was used on barns all across the U.S. for many years. It is still used today and comes in various widths and commonly used as an accent on garages and gables. The rustic out-door look of real hand cut cedar shakes at half the cost of real wooden shakes. The look of distinction! For centuries! Today's cedar shake look exactly like real cedar wood shakes. Vinyl Log Siding, rustic charm at it's best. Today the vinyl log siding looks just like real cedar logs. It is much less expensive than real Cedar logs, requires much less maintenance than real wood, and it is resistant to rain, snow, harsh winter winds and never needs painting. 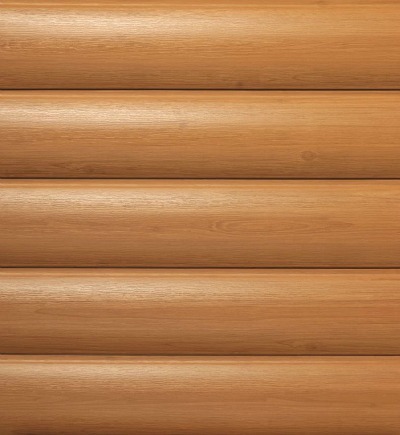 To see more info on vinyl log siding click here.. There are many different vinyl siding colors to choose from. Let your imagination be your guide. 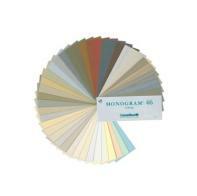 Each company has the basic colors and most manufacturers have their own special colors. One of the great things about choosing a color for your new vinyl is that you never have to paint it again. The colors are permeant and you never have to repaint! Maintenance is very low, just wash it down with your water hose once in a while to bring back the beauty. 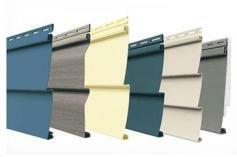 To see more info on the many different vinyl siding colors click here.. If you are just starting to look for vinyl siding for your home it can become daunting because of the many different types and styles. It is best to research several different products in order to find the one that best fits your needs, budget and home style. Like all products vinyl products comes in all prices, shapes and textures. 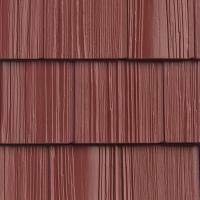 Use this site to compare and research many different siding products. Make notes on the products that you like and think would look good on your home. Use these notes to talk to your contractor to make sure you get the very best siding for your home. Installing siding should always be done by a professional. Professionals can do it better than the homeowner because they do it all the time! Always us a licensed contractor to install your vinyl siding!! There is a long history of home siding. Ever since man left the cave and started to build houses, he has wanted to put some kind of material around it. Sometimes to protect it from the weather, cold winter winds, or cold rain, or animals. Homeowners have used wood to cover their homes since there were homes. Click here to see more on the history of siding on homes. 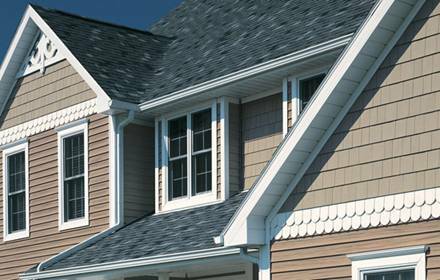 Vinyl siding is made to mimic real wood siding. 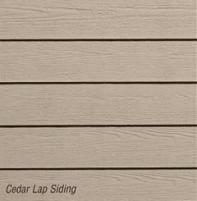 So any type and style of wooden home siding is now available in vinyl. How much does vinyl siding cost? Vinyl prices range from about $3 per square foot installed to well over $10 per square foot installed. It all depends on the quality of siding you pick out and the shape and size of your house. There are several things that go into the pricing of installing the siding. There is no general rule of thumb. 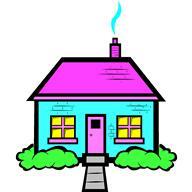 The shape of your house is very important also. How many corners is there? How many windows? How much work is there to be done to fix water and termite damage? To see more information on vinyl siding prices and siding cost in general .. click here...Vinyl Siding Prices. 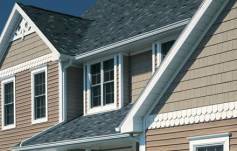 There are other costs associated with installing vinyl siding you your house. The actual siding is only one part of the 'installation process' and there are other costs associated with the installation that will affect the total cost of the project. To see more about these other costs, click here. Vinyl Siding Costs. Within each group of siding there are many different 'styles'. 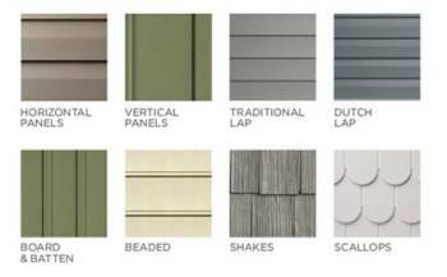 Types and styles of vinyl siding often get confusing but your contractor will know what you are talking about. Vinyl siding comes in many different colors, lengths, textures, profiles, thickness and prices. It is helpful to look over the many different products and make notes on the ones you think will look best on your particular house and one that fits your budget. Don't forget your trim! You should always add vinyl trim to your windows and doors to make your home maintenance go away. Cover everything never have to paint again! I want to see some pictures of siding on homes. 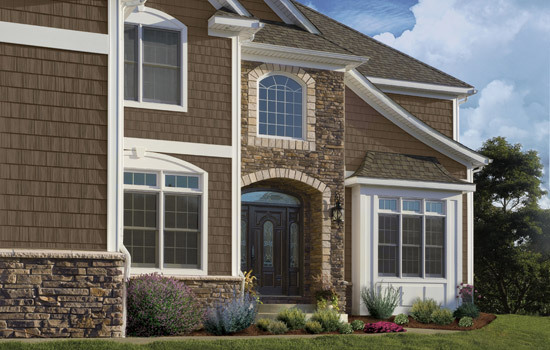 Vinyl siding is made to look exactly like real wood. In fact they use molds made from real wood when manufacturing the siding. Vinyl is only one of the made made sidings however. There are several other sidings available made from concrete, and other man made materials. This site is designed by some old home improvement contractors. Every day we work with homeowners who what to install siding on their houses but have no idea how to get started. We will show you how to get started and what to do first, second and so on. Our goal is to guide you along and show you how to work with your contractor to ensure that you choose the best siding products for your house and get the very best price possible. Homeowners need to have done some basic homework and have several basic facts about siding they have chosen to go on their house... before calling any contractors,... otherwise you will not know the proper questions to ask the contractor. If you don't know exactly what to ask for, you won't get it! We will show you how to gather important that will allow you to pick the best siding for your house and how to work with your contractor to get the very best price possible. Pick out the type of siding you think will look good on your house; vertical, horizontal or shakes (most people mix and match several different types to use on their homes). Choose the style; colors, profiles, texture and thickness that you like. Compare prices, see what other people are paying for similar products in your area. Then call several contractors and have them give you prices based on the products you have already picked out. Now you can easily compare different quotes apples 2 apples. This will save you a lot of time and money! Review the three basic types of siding and chose the ones that you think will go best with your house. Rugged outdoor look with charm. Vinyl Cedar shake used with stone. Beautiful. 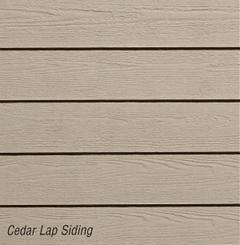 Click here to see more about Vinyl Cedar Shake Siding..
Horizontal or Clapboard Type siding comes in several different 'styles' or 'profiles'. Each style comes in different colors, textures and profiles. When people talk about 'style' generally they have picked out the type of siding they like (vertical, horizontal, shakes) and are now talking about the profiles, textures, thickness and colors that they like. Each type of siding has different 'Profiles' that are characteristic to that type of siding. Clapboard, dutch lap, beaded, cedar shake, board and batten all come in different widths. Profiles are how wide each board or panel is and whether it has a notch or shadow groove. There are wide boards and there are are very narrow boards. Generally each panel will run approximately 3" to 10" in width. In addition to the profile, there are different 'textures' of the boards or panels. 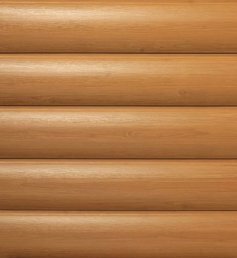 Since vinyl siding is made to look like real wood, and real wood has a texture that ranges from very smooth like sanded boards, to a really deep grain that looks like real cedar wood. To see more about the different Siding Styles, click here. Shop around and compare prices and what other people are paying for similar siding. You need to shop around and compare some prices from the local home improvement stores like Home Depot and Lowe's. Otherwise you will have no idea if the price the contractor quotes you is a fair price or not. 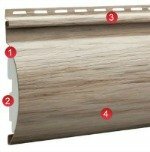 Click here to review some manufacturers of fine quality siding in many different types, styles, colors, thickness and prices. Manufacturers. What are some of the 'other' costs that goes into the quote. How much does it really cost to install new siding on your house? Total cost is made up of several different pricing components. How much siding (sq ft) you will need, and the quality of the siding you choose. Quality + Quantity. What the contractor charges to install the siding. How much labor will it take to make your house ready to have the siding installed. Every house is different so the amount of siding needed will vary house to house and so will the amount of work the contractor has to do to make your house ready for the siding to be installed. Do you have old siding that needs to be removed? Do you have rotted wood that needs to be repaired or replaced? Do you have termite damage that needs to be repaired? Do you need new soffit or facia? Do you want new gutters? There are many different items that goes into the final 'cost' of your new siding installation. Click here to see more information on what contractors look at when pricing your job, go to Costs. There is more to costs than just the price you pay for the siding. The most popular and time tested form of siding for a home. Wood is one of the most expensive types of siding for your home. Long considered one of the most beautiful sidings available for homes. Comes in a wide variety of types such as shake, clapboard, singles and lap. It can be applied both vertically or horizontally. Pro's: Warm and beautiful. Lasts longer than most other types of sidings. Adds charm to homes that only real wood can offer. Has superior aesthetics. Has natural insulating qualities. Con's: Expensive, requires regular maintenance such as painting and/or staining (as often as every 3 to 5 years depending on location). Can not be applied over other existing sidings, so a total tear off of existing siding must be done first. Non-moisture resistant species like pine and fir are highly susceptible to rot, and insects. Is not fire resistant. Concrete fiber board or concrete board also sometimes called Hardie Board or Hardy Board is made mostly of Portland cement, clay and sand with wood fibers. It has become one of the most rugged sidings available with great durability and low maintenance. It is highly weather resistant but needs periodic painting to keep looking new. Pro's: Accepts repainting easily, very weather resistant, fire resistant, and insect resistant. It is considered to be a masonry product and in some states may qualify for lower insurance costs. Comes in a wide variety of styles, colors and textures. For information, please click below. 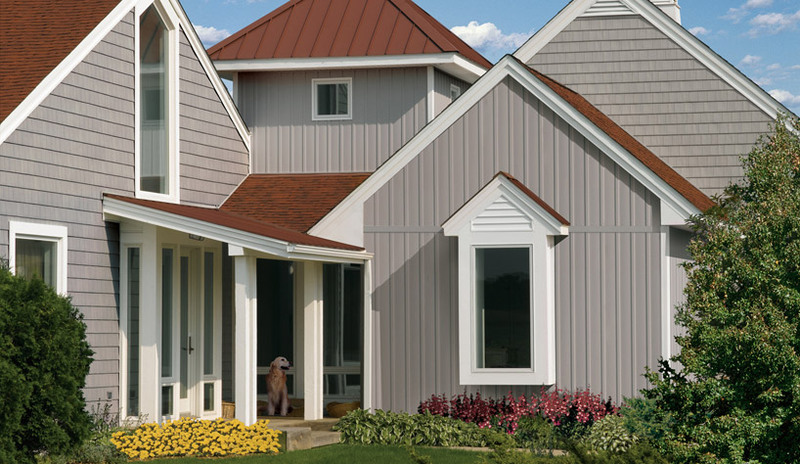 Aluminum siding comes in a wide range of factory finished colors and styles from smooth to wood grain. Slightly more expensive to install but should last 25+ years with little maintenance. Pro's: Factory baked on finishes last many years with little or no maintenance. Aluminum siding is insect and fire resistance. Can be touched up with special paint as needed. Easy to clean with soap and water. Con's: It is prone to denting, sometimes even by hail storms. Easy to scratch, bicycles and balls cause permanent dents and dings. Has no insulating qualities by itself.